More Copic Markers, as some days you just need to spend all day coloring. 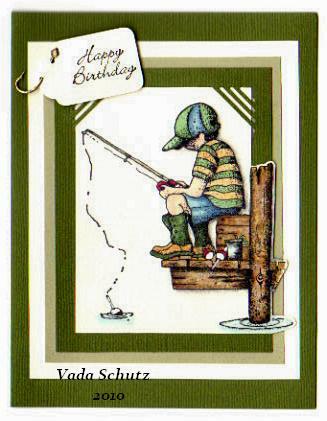 For card no 1. 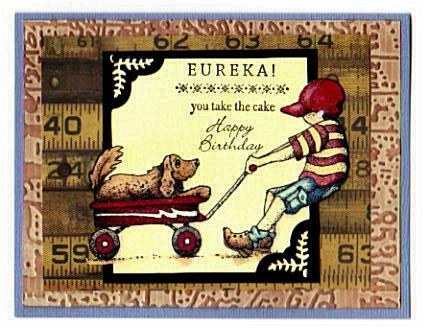 Main image is from The Rubber Cottage and Stampin Up and CTMH. For no 2. Stamp credits are The Rubber Cottage and CTMH. It was only 5 7 degrees here today, so a good day to stay in and color. Thanks so much for stopping in. all I can say is that I'm glad I stopped by--these are 2 amazing cards! Quite delightful artwork Ms. V! Love those images! Those little boy stamps are adorable I love the top one......all the elements are just perfect! I love your two cards, especially the first one. MMMMMM, Vada, these are so pretty. I agree, some days ya just need to sit and color, and the details on these are so clean and crisp. Love the color pallet you chose. OMG Vada!!! Both of these cards are just adorable and so beautifully colored! My favorite of course is the little boy with the dog! Have a great Sunday! Vada, these are gorgeous! You have such a way with color! GC. #71 Random Redhead Challenge is “Inches”. Dragged Madras and Cuttlebug Highlights. Artwork Brittle Batik from April 2006. GC 69# Chestnut Theme Challenge “Ancient Ages”.